Reload is a convenient way to consume additional high, quality Protein in between meals or whilst on deployment without adding unwanted refined sugars or saturated fats. Reload utilises a sustained release carbohydrate and tri Protein blend containing Whey concentrate, Micellar Casein and ultra-filtered soy isolate in a delicious oven baked bar. To avoid the protein being heated and potentially denatured, the oats are pre baked and the Protein added afterwards making this product unique and one of the highest quality and best tasting (in our opinion) bars on the market. Each bar is 70g. Grenade Reload Protein Flapjacks can be consumed in between meals for additional protein in a convenient, great tasting bar. Protein Blend (22%)(Soya Nuggets, Soya Protein Isolate, Whey Protein Isolate (Milk), Milk Protein Concentrate), Rolled Oats (Wheat), Rapeseed Oil, Humectant: Glycerine; Golden Syrup, Oligofructose Syrup, Brown Sugar, Cocoa Powder, Natural Flavourings. They should not be used as a substitute for a balanced diet and it is not recommended to consume more than 2 bars per day as excessive consumption of dietary fibre can have laxative effects. 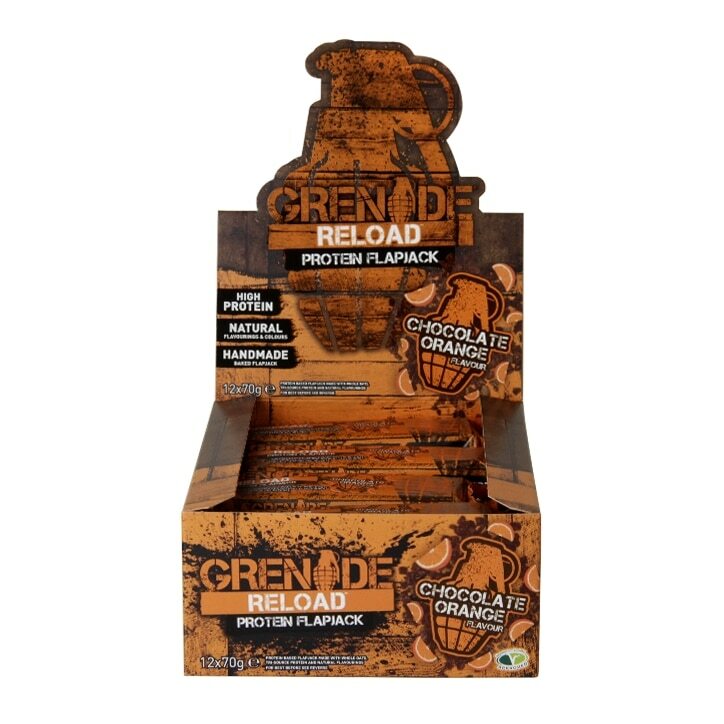 Grenade Reload Flapjack Chocolate Orange is rated 4.4 out of 5 by 9. Rated 5 out of 5 by Sammyh from Very tasty I bought these bars whilst healthy eating and still craving something sweet. They are very high in protein and really filling. Perfect before a work out or with a cup of tea in the evening. Rated 4 out of 5 by Marion P from Very tasty and softly chewy. Lovely high protein snack, very filling. A little too sweet for my taste buds, but most people will find this divine. Rated 5 out of 5 by Copie from Definitely buy again I brought this to have while I was out training on my bike. Tasted good and give me the boost I needed will definitely buy again.